Bright Colors from top, l-r: Non-Tarnish Silver, Brite Gold, Rose Gold, Hot Pink, Peridot, Titanium, Seafoam, Baby Blue, Fuchsia, Orange, Pacific Blue, Flag Blue, Lavender, Amethyst. Metallic Colors from top, l-r: Natural, Bronze, Antique Copper, Vintage Bronze, Smokey Quartz, Brown, Amber, Red, Magenta, Gun Metal, Black, Brown, Green, Teal, Purple, Blue. The following quantities are $6 each or four for $20 (four or more for $5 each). Mix color and gauges in any assortment you want! Remember that the smaller the gauge number, the heavier the wire is, so that 16 gauge is the heaviest and 28 gauge is the thinnest wire we offer. Please do not hesitate to order other gauges than those listed, it will just take at least a couple of weeks longer for us to fill orders for colors in gauges other than those listed in stock. 10-yard spools for twisting and crocheting. Bright colors are: Non-Tarnish Silver, Brite Gold, Rose Gold, Hot Pink, Peridot (metallic lime green), Titanium (shiny cool grey), Seafoam, Baby Blue, Fuchsia, Orange, Pacific Blue (dark turquoise color), Flag Blue (bright royal blue), Lavender (periwinkle blue color), Amethyst (bright purple). These colors have sterling silver plating under non-tarnishing color enamel. 20-yard spools for twisting and crocheting. Metallic colors are: Natural (light bright copper), Bronze (old gold), Antique Copper, Vintage Bronze (metallic taupe grey), Smokey Quartz (dark brown), Brown, Amber (copper color), Red, Magenta (wine red), Gun Metal (metallic grey), Black, Brown, Green, Teal, Purple (dark eggplant color) and Blue. Since the metallic colors do not have sterling silver under the non-tarnishing color enamel, you get more yards on a spool of any metallic color than you do on a spool of any bright color. 15 yard spools for crocheting, embellishing etc. available in all bright colors. 20 gauge also available in bright colors in 6 yd spools and metallic colors in 10 yard spools. 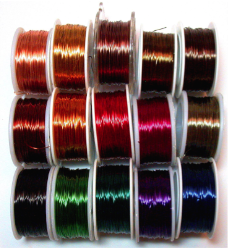 18 Gauge available in Non-Tarnish Silver, Brite Gold, Rose Gold, Hot Pink, Peridot, Seafoam, Baby Blue, Titanium, Pacific Blue, Lavender and Amethyst in 4 yard spools, and in 7 yard spools in Bronze, Copper, Antique Copper, Vintage Bronze, Smokey Quartz, Brown, Amber, Magenta, Gun Metal, Black, Brown, Green, Teal, Purple and Blue. 18 gauge is good for clasps, pendant backs and cuff bracelet frames requiring rigidity, as well as jump rings. 16 Gauge 5-yard spools are available in amber, vintage bronze and antique copper. 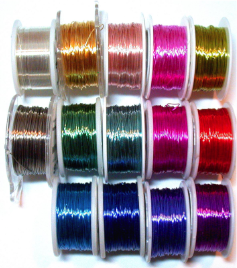 The following bright colors are only available in 5-yard 16 Gauge spools costing $12 each: brite gold, non-tarnish silver. We sometimes have larger 100-foot or 150-foot spools in 24 or 26 Gauge in selected colors at $12 a spool or $10 a spool for four or more spools. Ask what we have if you are interested.